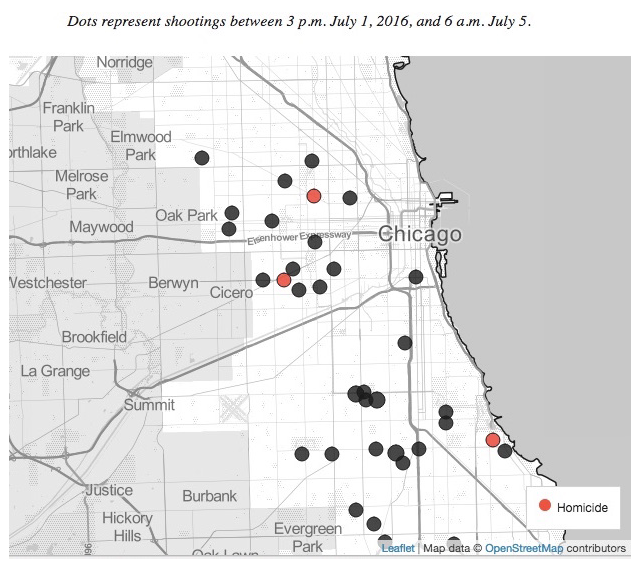 60 people were shot in Chicago during 4th of July weekend. 32 of the victims were shot within a 15 hour window between noon on Monday and 3 a.m. on Tuesday. Despite the city’s strict anti-gun laws, gun violence continues to run rampant. At least three of the victims were under the age of 10. Several other young teenagers were also shot and injured. Taniyah Williams, 5, and her cousin Corey Bondurant, 8, were among the many children caught in the middle of gun violence this weekend. Both children were shot in the leg while playing with other children and enjoying firework displays on the 5500 block of South Hermitage. Family members claim a group of men emerged from a gangway and opened fire, seemingly unprovoked. The shootings come just days after CPD Superintendent Eddie Johnson discussed what he claimed was a decrease in gang violence as late as Monday the previous week. Johnson boasted about recently arresting 88 gang members and increasing police patrols all over the city. The image below shows where a majority of the shootings took place during the final hours of the holiday weekend. The number of people shot this weekend isn’t uncommon. 63 people were shot during Memorial day weekend. Violence seems to be increasing. According to the Chicago Tribune 957 people had been shot, according to the Tribune. On Tuesday, the number for 2016 was around 1,500, the newspaper said. Reporter Who Claimed "PTSD" From Firing an AR-15 Now Wants To Ban "God Bless America"
WW2 Veterans Receive Epic Welcome After A Two Day Tour Of Washington D.C.